The following script is based on an article I wrote for the Allergy & Free From show magazine last year. With some updates! Lactose is a sugar, for this sugar to be used by us, the walls of our lower digestive system produce a digestive enzyme called lactase. This enzyme helps to break down the sugar so it can be made small enough to be taken into the body and used as energy. See the above infographic. Congenital lactose intolerance occurs because of the gut not being able to produce any lactase enzyme from birth – this is very rare. Primary lactose intolerance is where the gut loses the ability to create the lactase enzyme over time. Secondary lactose intolerance can occur with a digestive disease, gastrointestinal infections and food poisoning, which may or may not be short term. Some people’s ethnic background puts them more at risk of lactose intolerance because in South America, Africa and Asia, over half of the indigenous population have primary lactose intolerance and in some Asian countries almost everyone can have primary lactose intolerance. The symptoms from lactose intolerance can be unpleasant and embarrassing and range from loose, watery poo, wind, bloating and a distended tummy. Some people get stomach cramps, loud digestive gurgling noises, feeling sick and occasionally are sick. These symptoms occur because undigested lactose in the bowel pulls fluid from the body as it moves through the lower digestive tract, causing diarrhoea. Then lactose is then used for energy by the bacteria usually found in the bowel – this causes bloating and wind. Usually, digestive symptoms because of food poisoning are often quick to resolve (lactose intolerance after a digestive system infection usually resolves after six weeks), if you still struggle with symptoms, see your doctor, don’t be tempted to self-diagnose. Don’t be shy in talking about your symptoms – doctors have heard them all before. You can always write down your symptoms before you go if you just find them too difficult to talk about. The following symptoms are not expected with lactose intolerance if you have swelling of your lips, mouth or face; rashes or wheezing within minutes to a few hours of drinking milk. This might suggest an allergy – see your doctor. Or, alternatively, blood mixed in your poo with a temperature and feeling unwell. These are not symptoms generally associated with lactose intolerance and may be due to another medical problem. Contact your GP and don’t make drastic changes to your diet. All children should be seen by their doctor and lactose intolerance because of cow’s milk protein allergy should be considered. Because babies and young children are more vulnerable, any symptoms of blood or mucus in poo, green vomiting, a temperature and severe tummy pain in young children call NHS 111 for advice or discuss with your doctor urgently. What tests are available for lactose intolerance? No blood tests can identify lactose intolerance. Sometimes your doctor might advise a test called a hydrogen breath test – but often they will recommend following a full lactose-free diet for one month and then introduce lactose to test that symptoms return, which is usually very useful in identifying this intolerance. Testing food is also essential to find your own level of lactose tolerance. Most people can have a small amount without having any symptoms at all, and this knowledge can make following a lactose-free diet a little bit easier. A registered dietitian can help you do this effectively and check you are getting the correct nutrition from your modified diet. Might symptoms be caused by something else? Coeliac disease (autoimmune gluten enteropathy) this is because gluten, a protein in wheat, barley and rye, damages the bowel surface so it cannot make the lactase enzyme very well. See your doctor, and your doctor will complete tests for coeliac disease if it is suspected. It is vital to continue to eat food containing gluten to make quite sure that the tests used can identify coeliac disease well. Lactose intolerance usually resolves with treatment for coeliac disease. A few people with inflammatory bowel disease (IBD – Crohn’s disease and ulcerative colitis), which causes the bowel wall to become swollen and ulcerated, can also occasionally have problems digesting lactose. Due to inflammation of the bowel wall sometimes it cannot make the lactase enzyme very well. This lactose intolerance can resolve with treatment for IBD. People with irritable bowel syndrome (IBS) can have problems digesting lactose, this might occur because of the gut microbe fermentation of some foods (called FODMAPs.) Lactose is a FODMAP. FODMAPs are sugars found widely in the diet that are poorly digested and result in symptoms for people with IBS. If you wish to try a low fodmap diet ask your doctor for a referral to a registered dietitian to help you. Don’t be tempted to exclude all carbohydrates from your diet. Wholegrain starchy carbohydrates are essential for long-term gut health. In animal milk, some cheeses, some yoghurts, processed foods made from animal milk and some medications. Most medications contain tolerable amounts so don’t stop taking them. Discuss alternatives with your doctor or pharmacist if you are taking a few medicines containing lactose, as this might be enough to cause symptoms. Lactose-containing ingredients can be recognised on the food package ingredients list by the following words – milk, lactoglobulin, milk solids, buttermilk, lactose, artificial cream, whey powder, cheese, condensed milk, curd, skimmed milk powder, cream cheese, modified milk, evaporated milk, margarine and butter. As milk is an allergen, it will be listed as bold, in italics or in a different font or colour on the ingredients list. But lactose is not an allergen as such, so it doesn’t need to be listed separately to milk. Lactose-free animal milk products will be explicitly stated on the packaging by the manufacturer. Where can I find lactose free products? Much lactose-free milk and alternative milk products can be found at larger supermarkets and can also be sourced online. Some manufacturers are Lactofree (Arla), Candia, supermarket home brands, free from milk (Alpro, Oately, Rice Dream, Good Hemp, Koko and Provamil.) Please note rice milk should not be given to children under 4 ½ years of age. Other products, due to the processing methods used, might be lower in lactose naturally and some people can eat them with no problem such as standard hard cheeses and some yoghurts. Many other foods are typically free of lactose. Tiger nut milk is a new marketed product trend, and I really don’t see the point of having this milk, unless you are from Spain and have Horchata as a cultural drink. Tiger nuts are tubers, and you can buy tiger nut milk ready made – but often making your own is advocated by bloggers and companies alike. Marketed as paleo – with little other nutritional content in the milk except for carbohydrate this marketing ploy seems a bit odd. Neither has it been tested for fodmap content. So, people who have food intolerances and IBS, or those with inflammatory bowel disease, who may have associated conditions that result in extreme lethargy are required to make their own milk? You have to be kidding, right? There is no advantage to having this product nutritionally over and above other milk, and it does not naturally contain reasonable levels of calcium. This is exploitative of vulnerable patients in my opinion and risks long-term low calcium intake. Is animal milk bad for me? No, quite the opposite in fact – lactose-free animal milk contain good levels of calcium iodine and vitamin B12. Unless you have any religious, cultural or ethical reasons to avoid it, you could just swap to lactose-free animal milk products. These products contain the same level of nutrition found in regular animal milk and have the added advantage of tasting the same. We also know that the calcium found in animal milk is slightly more readily absorbed into the body than the calcium used to fortify plant-based milk. The internet is full of alternative articles scaremongering around the consumption of cows milk. While I have no issues at all with people who decide to avoid animal products for ethical, cultural or religious reasons, scaremongering others to avoid cows milk due to spurious health risks and unevidenced harms is unacceptable. You might have heard that animal milk leaches calcium from the bones, this is just untrue, and stories of milk being ‘too acidic’ for the body has no basis in science. Neither does milk cause excessive mucus production in the body or inflammatory bowel disease. Another nutritional consideration for those avoiding animal milk is that milk and dairy products are the primary sources of iodine for most people. So, avoiding cows milk and/or fish can also risk low levels of iodine in the body. Adults need 150 micrograms per day, pregnant and nursing mothers slightly higher at 200 micrograms, most milk alternatives are rarely fortified, too much-added iodine can also be problematic so ask your dietitian if you feel you are not getting adequate amounts. Raw milk contains lactose and is therefore unsuitable for people with lactose intolerance and can risk gastroenteritis (food poisoning) if it is not properly treated. I would not take the risk of drinking raw milk, particularly if you have any other digestive complaints. Can I buy a supplement to help me digest lactose? Yes, they are available online or from health food shops. However, the effectiveness of them varies. But they might be useful to have to hand when eating out and travelling when it might be a little more challenging to avoid lactose. Does having lactose intolerance affect my future health? Not generally, but not getting adequate calcium in your diet because you have stopped having all milk products long term can lead to weakened bones. Adults should ensure they have at least three portions of lactose-free dairy or calcium-fortified alternatives a day (a portion size is a glass of lactose-free milk, a small matchbox size of hard cheese, or a yoghurt.) People with bowel diseases and teenage boys need more than this, and other children less. Discuss with your doctor or dietitian. A useful calcium information sheet can be downloaded free from the British Dietetic Association website under ‘food facts’. I do not have any affiliations with the dairy industry and have never been funded or paid by them. Many people with IBS state that bread is a real issue in provoking symptoms. Is this true? What is it about bread that is the problem? This post aims to discuss the provocateurs of digestive distress in IBS (Irritable Bowel Syndrome). Cited as sustenance – for example, the line ‘give us this day our daily bread’ in the Lord’s prayer – having access to bread was life for the poor in the past and bread is a staple food in the United Kingdom. The first piece of toast dripping in butter and a cup of tea after a period of fasting through having surgery is one time I recall, and bread was all the food I desired. How wonderful it tasted. The mouthfeel of gluten is undeniable and can be identified by those who do need to follow gluten, wheat or fructans free diet. I have identified it when I have infrequently made a mistake, as in ‘wow, this gluten-free bread tastes GREAT’ only to later realise my mistake at a cost and in fact it was the standard wheat based bread I had consumed! In the past bread was made locally and bakers were part of the local community. When industrialisation arrived, bread, needed in large quantities as a staple food, soon was produced in factories, one of the possible reasons was because it was terrible work – bakers had to rise early and work hard to provide the daily loaf for their community. Is industrialisation the cause of bread symptoms? Many blame the Chorleywood bread making process and fast fermentation – but harking back to the bread of the past does not always leave a rosy glow. Adulterating food with cheap ingredients was commonplace in Victorian history, alum (aluminium salt) was added to the dough to improve it’s colour and was thought to be one cause of Rickets, by reducing the availability of phosphorus, leading to decreasing its absorption from the diet. ‘Resistant’ starch does what its name suggests – it resists digestion and is a component of fibre. Produced by heating/cooling treatment, these resistant carbohydrates are based on wheat (and other) grains. Now for a little bit of chemistry, not too complicated, I promise. Starch is a crystalline polymer (think of a chain of a necklace containing many small beads, each small bead representing a sugar molecule, the necklace representing a polymer chain – a starch). Chains of the starch molecules closely line up on cooling, forming crystals within the bread matrix, links (imagine two or more necklace strings joined together) or bridges between the starch chains makes the structure a tightly packed area, where our digestive enzymes (amylases) can’t penetrate. The speed and repetition in cooling and heating will affect the amount of the resistance formed. Exposed to up to 20g of resistant starch per day from our diet some of the bacteria (amylolytic) in our large intestine may be able to ferment these crystalline resistant areas more successfully . IBS has alterations in the gut microbes, meaning that gut fermentation is a possible consequence and symptoms likely, in those people with IBS. Research has shown that only certain types of bacteria are capable of digesting resistant starch of the form Bifidobacterium spp. and Clostridium butyricum but these types of study are limited. Consumption of these starches enriches the gut microbial populations with more of the microbes capable of breaking down the starch. We know that people with IBS have different populations of gut bacteria than the general public – a changing diet to improve symptoms is a possible cause of this difference. Similar mechanism to the mechanism that causes issues from resistant starch – in other words poorly absorbed starch components causes these starches to be fermented in the large bowel resulting in symptoms when the colon is overly sensitive in IBS. Wheat amylase-trypsin inhibitors are proteins that are found naturally in wheat and are resistant to digestion and were developed by the plant to act as a defence against parasites and insects. They are activators of innate immunity and are suggested to lead to digestive symptoms by activating an immune reaction in the gut mucosa resulting in low levels of inflammation. Bioactivity of these proteins was found to be lower in spelt flour – often stated to be tolerated better for digestion. Is it possible that these ATI’s or gluten activate an immune response that then sensitises the colon leading to reactions to fodmaps? The processing of wheat to produce bread, however, reduced ATI’s bioactivity up to 30-50%. But some people state bread is explicitly a problem so we should look at the manufacturing process specifically. Chorleywood bread making process – the case for fructans? All the above are commonly found in all wheat-based food, but bread is processed, what effects does this have? The Chorleywood process was developed in 1961 and improves production time reducing costs of bread production. This production method can also use a lower protein content flour, which was the type of flour available in the UK, to reduce costs of having to import flour with higher protein. The protein content in UK wheat has increased since this development, but this process is still used and widely disparaged as a cause of digestive distress. One fascinating study looked at the differences in symptoms between the general population and those with IBS and whether a longer fermentation would lead to lower gut fermentation and gas (1). Now, this study was tiny and was completed in vitro (it was not a controlled trial in human subjects, although human stool from volunteers was used) so, the conclusions would need further study. The Chorleywood process produced more gas more quickly, after simulated digestion. The more prolonged fermentation process also led to a higher level of bifidobacteria in the stool, the levels of these microbes are reduced in IBS. Bifidobacteria also produce less fermentation in the gut, suggesting increasing numbers compared with others may help reduce symptoms. So, the combination of less gas delivered more slowly and increasing commensal bacteria that produce less gas anyway, was suggested to equal better tolerance, which is perhaps a leap of faith to suggest that this reduction will reduce symptoms without it being tested in humans. Voila, testing in humans has been done (2)! A more extensive study in humans also looked at Chorleywood process compared with sourdough and showed that a more extended fermentation leads to the breakdown of ATI components and reduced fodmap levels BUT NO DIFFERENCE IN SYMPTOMS OF IBS. Both studies used constipated volunteers, so no difference there, the symptom production in the second study was reported to possibly be a nocebo effect – expecting symptoms due to previous experience. Which is possible, six slices per day is a considerable amount to consume for people who have an intolerance to wheat. Diet was excluded as a confounding factor but what is not clear is how the bread was eaten and whether this was different in the two groups – toasted, fresh, or frozen, perhaps taking us back to resistant starches? Also, about a third of people with constipation based IBS will have pelvic floor dyssynergia, which in theory could elicit symptoms that might not necessarily be helped by changes in the diet, if symptoms are severe. Both these studies were pilot studies and need further investigation on a broader population of people with IBS. For many people with IBS yeast is anecdotally reported to result in symptoms. We do not have any evidence that this is a problem and this has been dismissed by the medical establishment as a cause. No evidence means precisely that, we don’t know, so would it be an issue? Saccharomyces cerevisiae, a yeast, has been studied in improving IBS symptoms, so we have another situation of modulating the gut microbiota to improve symptoms. While we have absolutely no evidence that a low yeast diet is useful, in IBS treatment, it might lead to altering the microbiome and should not be advised, but this is an area indeed worthy of further study. I think in conclusion, symptom inducement in IBS with bread is complicated and needs further study – with this detail of research required for one food item – is it any wonder that we have not got a cure for this medical condition? Laatikainen R, Koskenpato J, Hongisto SM, Loponen J, Poussa T, Huang X, Sontag-Strohm T, Salmenkari H, Korpela R (2017) Pilot Study: Comparison of Sourdough Wheat Bread and Yeast-Fermented Wheat Bread in Individuals with Wheat Sensitivity and Irritable Bowel Syndrome. Nutrients. 2017 Nov 4;9(11). pii: E1215. doi: 10.3390/nu9111215. Coffee, caffeine and the complexities of digestion. Struggling with sleep? Constantly wired? Have to dash to the toilet immediately after drinking your morning brew? It’s possible that coffee is causing these symptoms. The caffeine contained in coffee is a gastrointestinal stimulant, this means caffeine increases the contractions that move the contents through the bowel, risking diarrhoea and urgency. For those with slower bowels (constipation) caffeine containing food and drinks may help you to go to the toilet, but caffeine does have other effects that should be considered. For those with alternating symptoms it is worth tracking you caffeine intake through the day – you may find that intake might be the cause of problems. Black coffee is not a fodmap containing drink – but it can cause symptoms of IBS – so it is an important dietary factor to consider. Many people with an overly sensitive digestive tract will experience symptoms with food and drinks high in caffeine, due to these exaggerated reflexes that occur with IBS. Older research suggests that for some people coffee can stimulate bowel function within 4 minutes of drinking it. This cannot possibly be a direct affect of coffee traveling through the bowel – but suggests that a pharmacological (drug like) affect or perhaps due to hormone stimulation? Production of the hormone gastrin by the stomach is stimulated by coffee, which results in increased movement of the digestive system by the gastrocolic reflex (an involuntary and nearly instantaneous movement in response to a stimulus.) This reflex in some people is caused by the act of drinking coffee (the stimulus) and results in the bowels emptying to ‘make room’ for the next meal. This reflex can often be exaggerated in people who have problems with their bowels. Coffee has a low osmolality of 58 osmol/Kg – meaning that drinking it black with no sugar can affect how quickly fluids pass from the digestive tract into the body – low osmolality drinks can result in fluids being absorbed more quickly. Drinking coffee with a meal could reduce these effects and so can adding milk/sugar (but sugar is not great for health) – so, having a breakfast of a cup of black coffee or a strong shot of espresso to kick start the day might not be too helpful for those with IBS. Caffeine also has systemic effects on the body it is a bio-active compound – in other words – it can result in other symptoms in the body that might have consequences for people with IBS. IBS is also systemic condition, symptoms are not just confined to the digestive tract – see here for a comprehensive list of other symptoms https://www.theibsnetwork.org/have-i-got-ibs/what-is-ibs/. Not everyone has the experience of the stimulation of the nervous system as a result of large intakes of caffeine. If you are affected however caffeine can exert the following effects – increases in perception of alertness and wakefulness, palpitations, high blood pressure, insomnia, headaches and sometimes anxiety depending on individual tolerance. Is it just the caffeine that is responsible in coffee for causing symptoms? Coffee contains many different compounds and whilst caffeine is responsible for some systemic effects there is little evidence that de-caffeinated coffee has and affects on the bowel – but some anecdotal evidence suggests that it might. Some people also have bladder problems with IBS – urinary urgency and frequency can be affected by caffeine containing drinks. This is because they can relax the muscles in the pelvic floor. Health advice for sleep hygiene suggests that drinks containing caffeine should be limited a few hours before bed to avoid insomnia https://www.nhs.uk/conditions/insomnia/self-help/ Poor sleep is also associated with IBS with up to 74% of people with IBS stating that sleep is a problem and insomnia can increase levels of pain and perception of pain the next day. It is worth trying to incorporate some aspects of sleep hygiene into your treatment, if this is a problem for you. Where else is caffeine found? *Also contains lactose and fats, which can also induce symptoms. Caffeine can also be found in medications – discuss with your doctor or pharmacist if you wish to cut down or change medications. How do I reduce my intake? Because coffee is a bioactive compound immediately stopping drinking it can cause symptoms in susceptible people. Symptoms of withdrawal start 12-24 hours after abstinence and can last for 2-9 days. Symptoms are headache, fatigue, depression, difficulty concentrating, irritability and ‘brain fog ‘. So DO NOT be tempted to go cold turkey, if you are considering cutting down on your intake. Cutting down gradually is helpful for withdrawal effects, slow changes can also help with maintaining the changes you have made. Try reducing your intake by half a cup a day over a seven day period. Ensure you have other fluids available to drink – water or squash for example, to keep hydrated. You could use decaf tea/coffee if you wish but this might be a problem for some people perhaps. Don’t be tempted to use coffee weaning products – they are expensive and have no evidence that they work. Gulp, Adventures on the Alimentary Canal – a review! 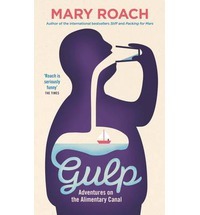 Gulp – Adventures on the Alimentary Canal, is the perfect book for my blog! This is a wonderful lighthearted trip down the digestive tract with lots of fun, facts and interesting comments. Mary writes genuinely funny chapters on diverse subjects such as designing pet food (your pet is not like you – really, you should read this), how to survive being swallowed alive to the exploits of surgeon William Beaumont who experimented on the hapless Alexis St Martin who was left with a fistula from his stomach to the surface of his skin after a shooting – facilitating many a gruesome experiment. Sounds a bit ghastly but Mary treats each subject in such a cheerful way you really wouldn’t know it. Now – tell me you are not even a little interested? This book was provided as a birthday gift from a friend – couldn’t resist telling everyone about it.